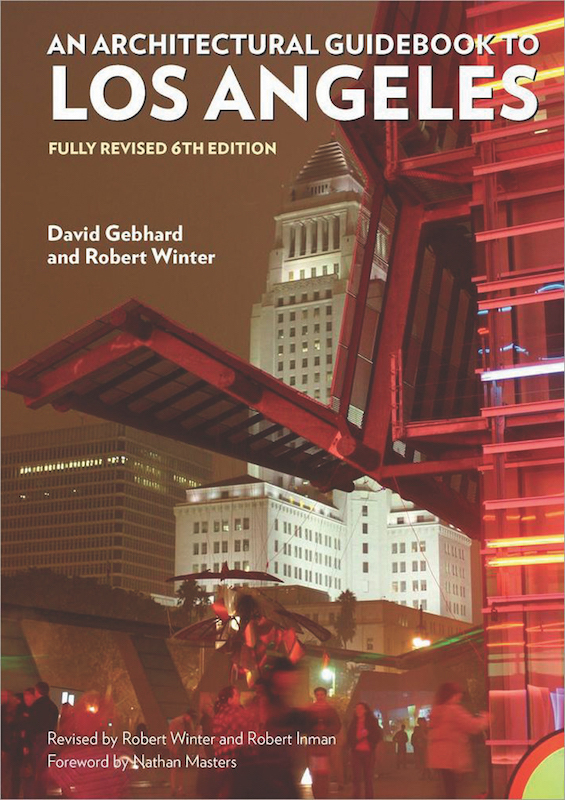 PUBLISHED DECEMBER 2018, “An Architectural Guidebook to Los Angeles,” by Robert Winter, David Gebhard and Robert Inman, Angel City Press, 6th edition. It was “the 1960s,” and the Los Angeles Cultural Heritage ordinance was only three years old. People were just beginning to talk about how to protect important buildings of past eras. Development was in full swing as the population of postwar Los Angeles continued to grow. The book, designed to fit in the glove compartment of your car, was published by the Los Angeles County Museum of Art. (If you have one, it is a collector’s item now and very rare). The book divided Southern California into 14 areas, then into smaller geographic districts. It was, if you will, one of the first self-guided architectural tours available for the car culture. “Gebhard and Winter,” as the tome is known to many, quickly became a revered reference for architectural historians and preservationists. Dubbed “the Bible” for many years, a citation in the book was one benchmark establishing a building’s significance in the absence of formal architectural inventories and studies (methods of identification that did not come to prominence until a decade later). Winter disavowed the notion, saying, “It’s by two guys; it’s their personal opinions; that’s all.” But it wasn’t all, because of course, Professor Winter is one of the foremost experts on the built environment who we have, and at 94 he still knows how to tell the story better than anyone. Every lecture he gave was witty and memorable, and his pithy comments as a commissioner of both the Pasadena and Los Angeles cultural heritage commissions are unforgettable. The publication has seen six editions (1965, 1977, 1985, 1994, 2003 and 2018) in more than 50 years. Gebhard died in 1996; Winter continued to update and edit. For the 2018 edition, he chose as his collaborator one of his former students at Occidental College and an author in his own right, Robert Inman. In this latest edition, there are more than 450 new entries for structures built before 2003 and 200 new entries for structures built after 2003, for a total of more than 2,300 sites. Winter’s work comprises a love letter to Los Angeles, perhaps one of the longest running Valentines ever. Share the new guide with your loved ones. Happy Valentines Day, Bob (and Bob)! Your gift to us is enormous, and we thank you.